Heat an oven safe saute pan over medium-high heat. Combine sea salt, granulated garlic, pepper, lemon thyme, summer savory, and pineapple sage on a dinner plate. Mix spices with fingers, rubbing the herbs between your fingers to release oils and to make the mixture more coherent. Spread this over the plate and then roll pork tenderloin in it to coat. Preheat oven to 325 degrees Fahrenheit. Add lard to saute pan and let it melt to coat pan. Once pan is hot, place pork in it to sear. Let the pork cook, undisturbed for 5-7 minutes until the pork has a blackish-brown crust. Turn tenderloin with tongs and let sear on the other side for a couple of minutes, then place pan in preheated oven. Bake for 12-14 minutes. The pork, when pressed upon will still be slightly squishy, that is okay, it means the meat will remain juicy once sliced. Lest rest 5-10 minutes before slicing. 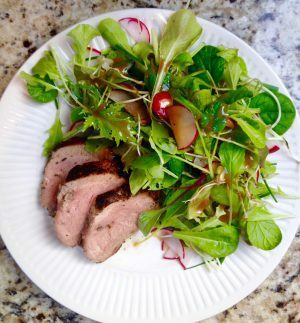 I served this tender pork tenderloin alongside a simple green salad with radish and chives topped with Stacey’s Salad Dressing for a weeknight meal. This pork makes a nice holiday dish too!